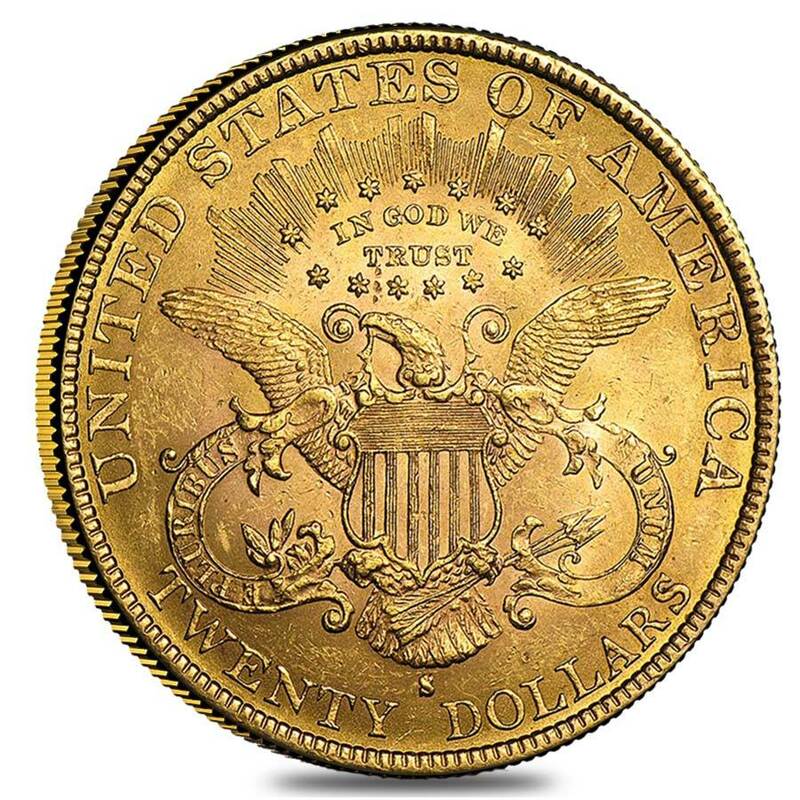 The $20 Double Eagle Liberty Head owes its beginning to the California Gold Rush in 1849. California which was earlier a part of Mexico, had recently become part of the United States of America. California had just started to settle down with only small groups of settlers moving in every year through the Oregon Trail, when in January 1948 flakes of gold were discovered in the Sacramento River in California. The news of gold discovery changed the history for California and United States alike. More and more people and supplies started rushing into California. The bountifulness of gold changed the future of United States and its monetary system which would never be the same again. Until that time S10 Gold Eagle coins were used in trade and it was also the highest denomination available. 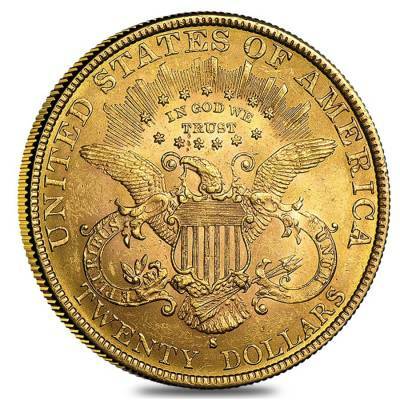 After the gold started flowing from California mines into the United States Mint, the government authorized the Mint to start striking an even higher denomination than $10 which is the $20 Gold Double Eagle Liberty Head. The US Mint produced two Double Eagle pattern coins in 1849, of which one resides in the National Numismatic Collection at the Smithsonian Institution in Washington D.C. The whereabouts of the other is unknown so far. Chief Engraver James Barton Longacre made the design for the coin. This Double Eagle Liberty Head Gold coin was minted for commerce in 1850 with a slight modification in design. It was an instant hit and banks and merchants started using it successfully in local trade and overseas trade. 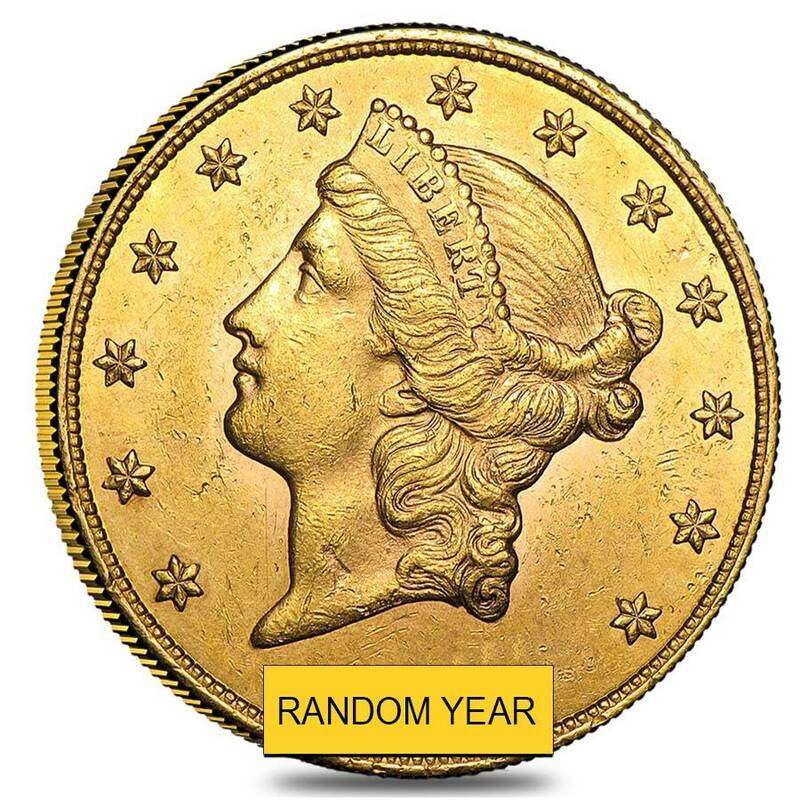 This coins were struck from 1850 till 1907, when a new $20 Gold Double Eagle Saint Gaudens design took over the Liberty Head design. President Franklin Roosevelt’s 1933 Executive Order 6102 required people to turn in their gold coins and bullions to the US Treasury during the time of the Great Depression. A majority of these coins were melted down to make gold bars. 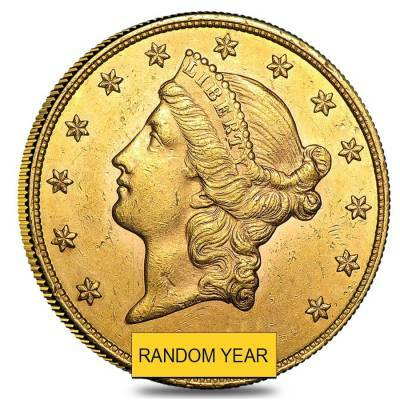 Due to this event very scarce amount of the $20 Gold Double Eagle Liberty Heads, and other Pre-1933 US Gold Coins are remaining throughout the world. Due to their scarcity, they have very high demand by collectors as well as investors. Contains .9675 Troy Ounce of .900 pure gold. Obverse - A design by James B Longacre, depicts leftward facing Lady Liberty wearing a pearl-studded Coronet with “LIBERTY” inscribed on it. Encircled by 13 stars to represent 13 original colonies of US. At the bottom is year of mintage. Individual coins will be shipped in protective plastic flips. Higher numbers will be packed safe for shipping. Dates will be chosen randomly and are determined by our available inventory on hand. U.S. Mint issue from the following mints – Philadelphia, Denver, Carson City, San Francisco, or New Orleans. The significance, age, and design, adds a collectible value to this coin. The rarity and condition of the coin can fetch a high premium for the coins. Even when the economy is down, the value of gold will still be high. Investing in gold is a sound and profitable choice. Due to its use in many industries, there is a high demand and value for gold. When stock market crashes gold prices hike. These coins are considered heirlooms and collector’s items, hence there is a protection from seizure by the United States Treasury by Law. Allows you to diversify your investment portfolio. It is time you made the right choice now so that your investment proves fruitful in the future. Do frequent out website as we constantly add a variety of new products ranging from gold products to silver, platinum, and palladium products. Check out our interesting collection of American Gold Buffalos. For any assistance or queries contact Bullion Exchanges at 800.852.6884 or email to info@bullionexchanges.com. Our customer service representatives will be happy to help you. Like all of our other gold coins, this one is guaranteed to be 100% authentic. Item will be wrapped and packaged safe for delivery. With this purchase, you earn 1283 Bullionaire Bucks 1283 BB = $1.28. We currently have 6 of this item in stock. For every $1 spend, you will earn 1 Bullionaire Buck which is equivalent to $0.001 off a future purchase. 1283 BB = $1.28.